Funko Pop! Marvel - Guardians Of The Galaxy - The Collector #77 . Condition is good used condition. Slight damage to box. Dispatched with Royal Mail 2nd Class. Funko Pop! Marvel MCU - Guardians Of The Galaxy - The Collector #77 . Condition is New. Dispatched with Royal Mail 2nd Class. Buy it now to avoid missing out. Funko boxes are bubble wrapped and air pockets used to prevent any moving. These boxes are incredibly fragile and if the box is a high priority to you we request you view the advert images uploaded. Funko Pop! 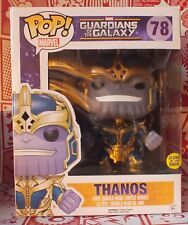 Vinyl #78 Marvel Guardians of the Galaxy Thanos Glow in the Dark RARE Hi comes with a FREE POP PROTECTOR This Thanos has just come in today and is so cool - he glows in the dark and has his armour on. A great addition to your Marvel collection and a 6" POP that makes it look even better. This really glows in the dark as well which is super fun on your shelf with other pops. The Ron Pop is to show you the size only. This is brand new and comes from a smoke free home he will be posted in a sturdy box and wrapped well. Funko 2015 Convention Exclusive Dorbz XL 6 Guardians Of The Galaxy Rocket Raccoon. Genuine Funko Pop! SPECIAL EDITION variant Gold STAR-LORD (Guardians of the Galaxy / Peter Quinn / Marvel Universe). Marvel Studios. From Guardians of the Galaxy 2, Star Lord, as a stylized POP vinyl from Funko! Collect them all! Funko Pop! FUNKO POP! MOVIES: Guardians of the Galaxy Vol.2 - Star-Lord. Guardians O/T Galaxy 2. Collect and display all Guardians of the Galaxy 2 POP! I will help as much as I can. This is a cool item. Lots of photos are included so you can see exactly what you are buying. Its condition is consistent with its use and age. There's no problem there. 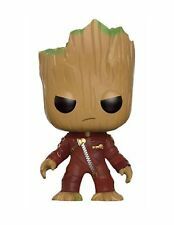 Funko Dorbz Guardians of the Galaxy Vol 2: Taserface - Vinyl Collectible 290 NEW. Condition is New. Dispatched with Royal Mail 1st Class. Stan Lee #281Guardians of the Galaxy Funko Pop RARE With Pop! Protector. Condition is New. Dispatched with Royal Mail Signed For® 2nd Class.